Caribbean regulators have taken over the Bank of Antigua, owned by the Stanford group, amid fraud accusations. The move comes after governments elsewhere, including in Peru, Venezuela, and Ecuador, suspended operations at banks owned by the group. 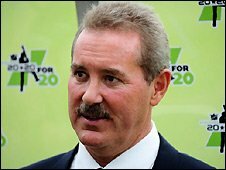 Sir Allen Stanford stands accused by US financial authorities of involvement in an $8bn (£5.6bn) investment fraud. He was served civil papers on Thursday. The billionaire had been the single biggest private investor in Antigua. The Securities and Exchange Commission (SEC) has accused Sir Allen of an alleged fraud "of shocking magnitude". However, he is not in custody and has not been charged with any criminal violations. Authorities in the US claim that Sir Allen attracted clients by promising unrealistic returns on investments. Customer accounts held by Stanford Financial Group were frozen until legal claims could be resolved, Reuters news agency reported the company's receiver as saying on Friday. "For the foreseeable future, customers cannot use their accounts to make payments because transfers out of these accounts are frozen until the receiver is able to verify there are no legal or equitable claims against those accounts," said Ralph Janvey, a Dallas lawyer responsible for recovering Stanford assets. Earlier in the day, the England and Wales Cricket Board (ECB) ended all contractual links with the billionaire. The ECB had signed a multi-million dollar deal with the Texan to stage a series of Twenty20 cricket games and tournaments both in the Caribbean and in England. The England team will not take part in any future Stanford Super Series matches, and the Stanford-sponsored Quadrangular Twenty20 games planned for England in 2009 will not now take place. The Eastern Caribbean Central Bank says it took control of the Bank of Antigua to prevent a run on the bank after the SEC filed civil fraud charges against Sir Allen in the US. The bank was not named in the SEC's complaint. The central bank said it had taken the step after "an unusual and substantial withdrawal of funds". The move by Antigua regulators is aimed at maintaining stability and reassuring customers, correspondents say. Antigua's Financial Services Regulatory Commission has named a British firm, Vantis Business Recovery Services, as a receiver of Stanford International Bank and Stanford Trust Company, the Associated Press reports. In 2006 Sir Allen was knighted by Antigua and holds Antiguan citizenship.